This article is 2839 days old. 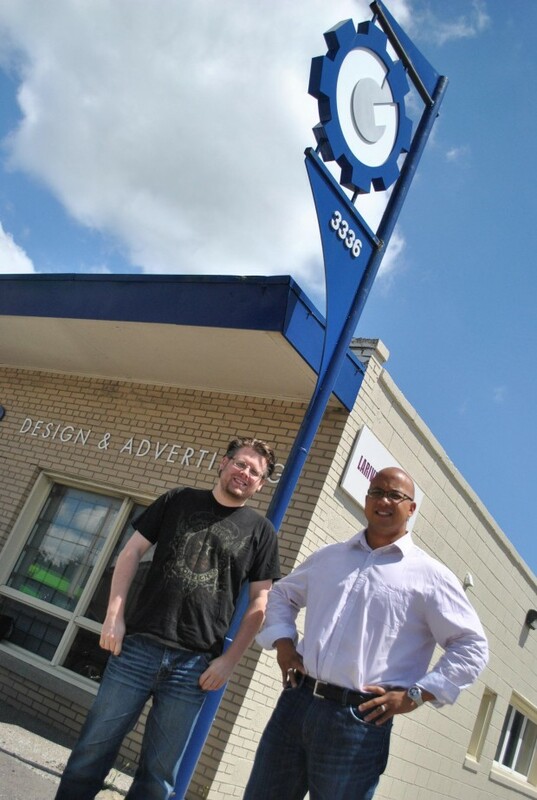 Alan Crouse and Jose Guzman, Generator Design business partners, say their exterior signage has helped stir up conversation and generate inquiries into the business that sits under the giant gears. Scrimping on curb appeal may not bode well for business as experts say consumers tend to flock to the better-looking boutique, at least initially. Companies can be successful without superlative branding, says branding baron Ed Roach, founder and CEO of the Branding Experts, adding that proper branding will be a value-added aspect to any enterprise. Roach has been revamping organizations for over 30 years by instilling the importance of a strong, meaningful brand that accurately portrays the product or service being provided. “When branding is done properly it raises the bar and makes you even more successful. To say you aren’t going to be successful with poor branding simply isn’t true because if you do have a good product or good services, that in itself speaks quite a bit,” said Roach. He said independent businesses need to keep tabs and take the reigns on ensuring brand image uniformity as many inconsistencies stem from impetuous suppliers. Roach noted that having a business card logo mismatching store signage may bewilder potential clients. “From a brand perspective, consistency is a really big deal and if it’s inconsistent you’re really confusing your audience,” said Roach. Generator Design, a Windsor-based technology design and consultation firm, has had no problems creating a seamless design strategy to distinguish themselves from their competition, according to creative director Jose Guzman. Initially, he said, they did not crank out a branding package for the sake of doing so, but rather ensured the brand would be understood and everything released was purposeful. “I think newer clients that I take on feel a little bit more secure with someone that has the external signage and makes it a little bit more of a reputable business that you’ve kind of invested in your own self-image and I think it gives them the confidence that you care about yourself …,” said Guzman. Businesses in need of a complete visual facelift will be facing off against one another for two grand prizes of $10,000 — one chosen via online voting and the other by 11 panelists at FastSigns headquarters. The cash prize will be surrendered in the form of a signage makeover for the two businesses with the most unappealing signs. Brought to you by FastSigns, a signage design and creation company, the competition takes place all over North America and online voting begins Aug. 22. “If businesses are struggling a lot of the time it’s because they’re not noticed … all of a sudden the $10,000 in all new storefront signage could completely transform a company’s identity,” said Joe Iera, the marketing coordinator for the FastSigns in Windsor. 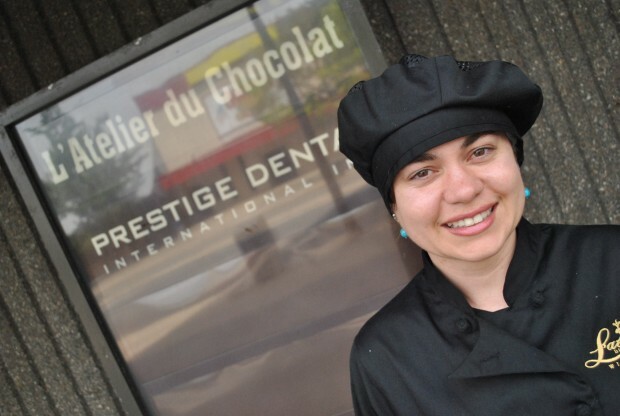 A chocolatier recently relocated her store, L’atelier du Chocolat, to Windsor’s downtown core, but many passersby may have missed the move because the exterior signage is “very poor,” according to the chocolate shop’s owner Débora Charron. She moved from Brazil seven years ago and plans on entering the signage makeover contest. Whether she wins or not she said she will be attaining “eye-catching” signage in order for patrons to know her business exists on 737 Ouellette Ave.
“Winning the contest would mean the world. It would also establish my presence in downtown Windsor,” said Charron. When prompted with a scenario of two competing businesses — one with proper branding but a poor product and the other with subpar branding and an exceptional product — Roach said he believes the shop with attractive curb appeal will initially attract consumers but the better product will prevail. This emphasizes the significance of differentiating a business’s appearance from their competition and following it up with a product that supports the brand. “If they don’t stand out they blend in, if they blend in they’re not leaders … and typically if they’re not leading they’re following and nobody gets ahead by following,” said Roach. Débora Charron, local chocolatier and owner of L'atelier du Chocolat, recently relocated her shop to 737 Ouellette Ave. and displays her "very poor" exterior signage. She will be entering FastSign's $10,000 signage makeover contest with plans to create a more "eye-catching" appearance outside of her storefront.